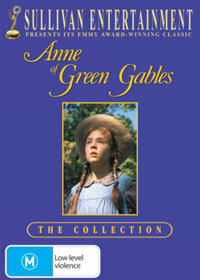 Anne Of Green Gables DVD Box Set includes the first three Anne of Green Gables titles (Anne of Green Gables, Anne of Green Gables The Sequel, Anne of Green Gables The Continuing Story) in an attractive box set. ANNE OF GREEN GABLES DVD: Tony and Emmy winner Colleen Dewhurst and Academy Award winner Richard Farnsworth and Megan Follows, give unparalleled performances in this critically acclaimed motion picture based on the international best-selling novel. Filmed amidst the spectacular scenery of Prince Edward Island, Canada, this Emmy award-winning movie follows the enchanting life of orphan Anne Shirley (Follows), from her struggles as an adolescent to her triumphs as a young woman. A delicate epic full of wit, style and emotional power. ANNE OF GREEN GABLES: THE SEQUEL DVD - Anne Shirley makes the transition from a romantic, impetuous orphan to an outspoken, adventurous and accomplished young teacher. Actress Megan Follows returns to her role as Anne. Tony and Emmy winner, Colleen Dewhurst stars opposite her as the aging Mariquilla Cuthbert and Oscar winning actress Dame Wendy Hiller appears as the prickly dowager Mrs Harris. An emotional follow-up full of wit and charm to the epic tale of the beguiling red-head. ANNE OF GREEN GABLES: THE CONTINUING STORY DVD - Now in her twenties, Anne returns to Avonlea for the first time since Marilla Cuthbert's death. Gilbert has been offered a position in a hospital in New York and he persuades Anne to come with him. He arranges a position for her at a large publishing house. Big city life isn't what they expected. Anne's manuscript is stolen by a dashing American writer, jack Garrison. Thus the stage is set for another installment in the Emmy award-winning Ann of Green Gables story which follows the characters from New York, the war effort in Europe and eventually returns them to the red earth of Prince Edward Island. Click the button below to add the ANNE OF GREEN GABLES - COLLECTION to your wish list.